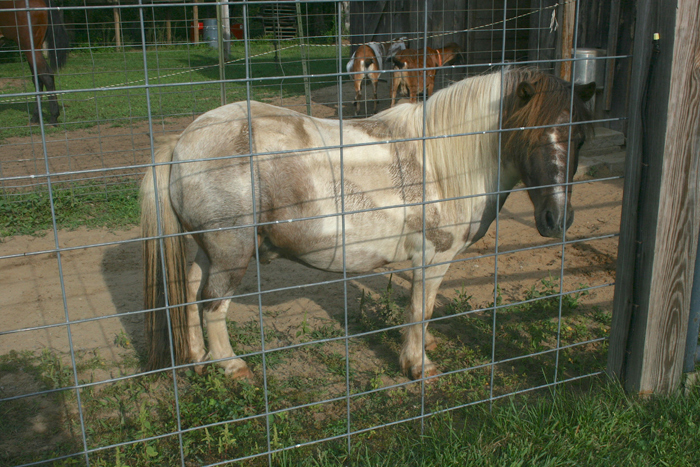 We all love our little pony Caddy, but we often have to laugh and call him “Pig Pen”! You remember the character from the Peanuts Comics, yeah like that. Caddy insists on this strange morning routine. Every morning, I go out to do the barn chores. They include cleaning the manure from the stalls and the paddock area. This time of year, after I groom Fasci and Caddy I apply a homemade potion that helps to keep the flies, mosquitos and blackflies from biting. I use a small rag to get the inside and outside of their ears and face and then spray down the rest of their body with a fine mist. They are both very appreciative and usually wait for me to apply their fly stuff before they head out and brave their tiny biting foes. But as soon as I finish Caddy, he has to apply his own accessory; dirt! Unfortunately his paddock area right outside his stall is dirt( I did seed this years ago but as soon as I took the barrier down the grass was gone and it’s been dirt ever since). So Caddy just has to walk outside his stall and lay down and roll in the dirt. Sometimes he rolls over and other times he gets up and repeats the process to make sure he gets both sides. When he gets up, he shakes, like a dog and a cloud of dirt rises from him, just like in the comic strip. Now you should not think he only does this in the summer, he does this year round. But this time of year when he has been sprayed with bug stuff the dirt really sticks to him. We still love him, we just call him our little “Pig Pen”. Posted by Maryclaire Mayes on Friday, August 30th, 2013 at 09:03 and is filed under My Life and Family.